After all the meat that we had eaten to usher in the new year, it was time for some vegetable detox. On a serious note, I ended up buying way too many vegetables from the produce market on the way back from PYO strawberries at Phil Greig's. Further, biryani is a very easy to carry picnic food too, considering we are planning a small hike/picnic tomorrow - marking the completion of the 4 day weekend down under. The weather was quite unkind for the first 2.5 days. Here's hoping for better weather tomorrow. 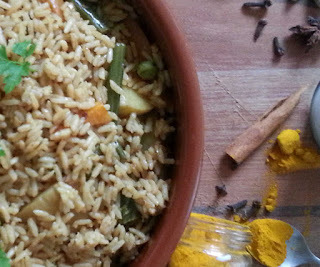 Coming to the biryani - there are many ways to make a biryani - from the cumbersome dum biryani to mughlai biryani to this adaptation of a pulao - a one pot meal. Most households in middle class India would make some version of a pressure cooker biryani with the dum biryani saved for special occasions. Don't let the long list of ingredients deter you in anyway. It is very simple and easy to put together. Note : I use a gas cooker which I will swear by anyday and the timings may vary if you use any other type of cooker. Prep time: 5 min+ ongoing during cook time - that's the trick to get you free in 30 minutes. Turn the heat to low and let the onions fry. Keep an eye on them from time to time and proceed with the prep for the remaining. Peel the 4 cloves of garlic and inch knob of ginger. Pound them along with 1 tsp whole black pepper corns in a mortar and pestle to as fine a paste. Pick and wash the rice. Fry for a minute until the raw smell is gone. Mix 1/4 tsp turmeric powder, 1 tsp coriander powder, 1 tsp cumin powder, 1 tbsp red chilly powder in a little water and add it to the cooker. Throw in the tomato fry until fat separates. Put in the 1.5 cups washed rice, 1 chopped carrot and 10 green beans. Fry for a minute. Put in the 1/2 tsp garam masala, generous pinch of kasuri methi and lemon juice. Adjust the salt such that the water tastes a little bit on the salty side. Close the lid. Increase heat. Once the pressure starts to rise, turn heat back to low and cook on low for 8-10 minutes and turn off. Let the steam release on its own. Serve with raita. I blended 4tbsp yoghurt with 2tbsp fresh coconut scrapings, salt and 1/2 tsp cumin seeds. To this I added another 4tbsp yoghurt and whipped it through. 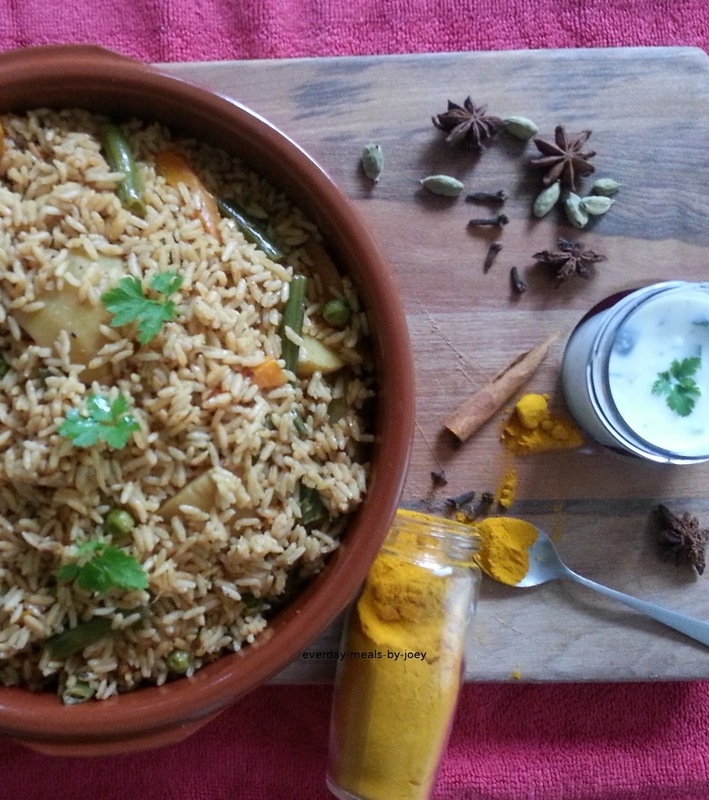 If you don't have coconut, just fresh cumin powder transforms the yoghurt to a delightful raita. 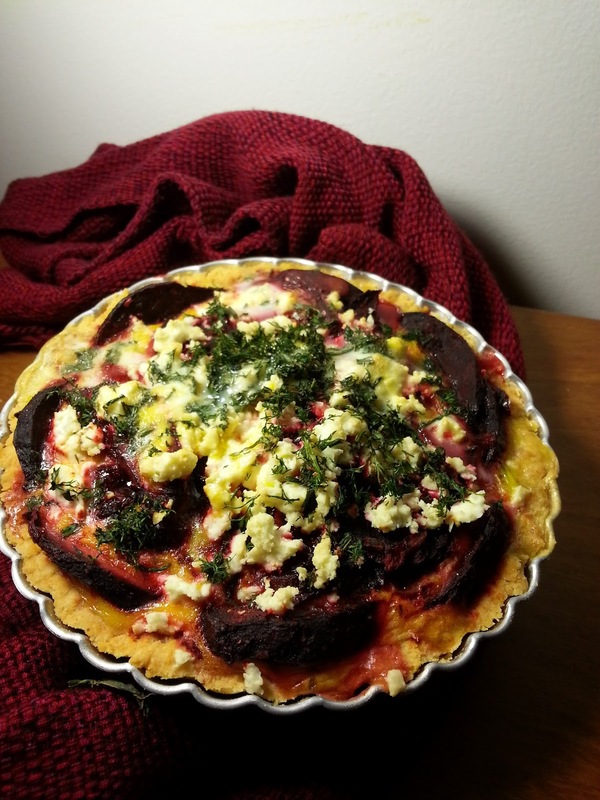 Use whipped coconut cream or coconut yoghurt to make it a complete vegan meal. What better way to usher in the new year [and get back to giving the blog some attention] than to cook up something easy yet delicious? These lamb cutlets that I made following the recipe from here were deliciously juicy and had us feeling like we had eaten at a fine dining restaurant. 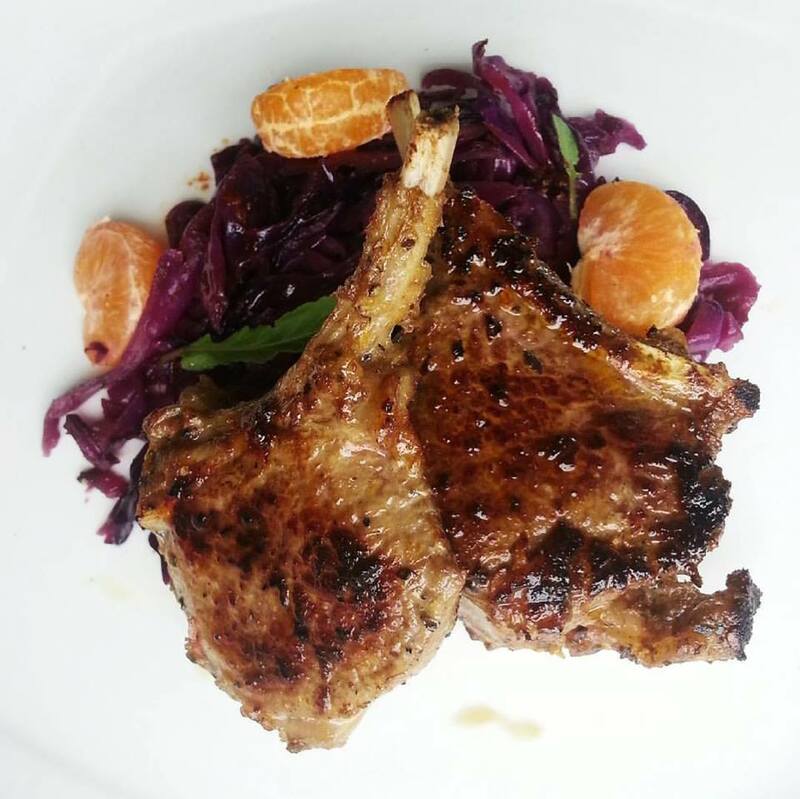 And yes, meat can be "Light and Refreshing". The orange is a very interesting addition which takes this to new levels. Make these and I am sure that you will agree. 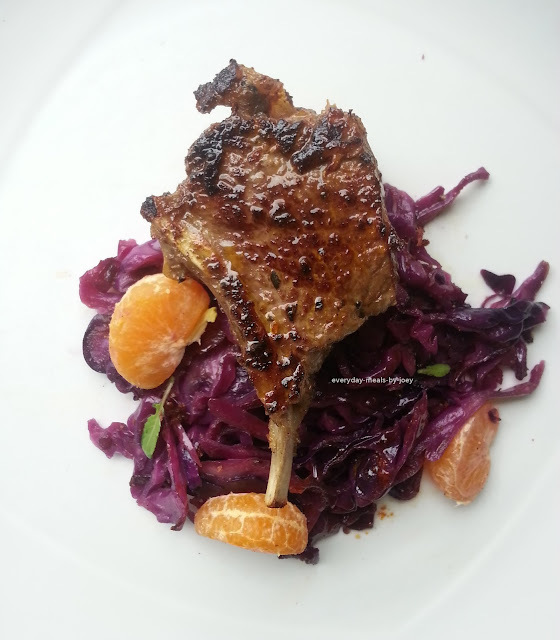 Using a hand scraper, grate the medium sized orange to get the zest. Place the lamb cutlets in a ziploc bag and pour the marinade over. Mix well and rub it in to ensure that all pieces are coated. Place the closed bag into the refrigerator overnight to marinade. 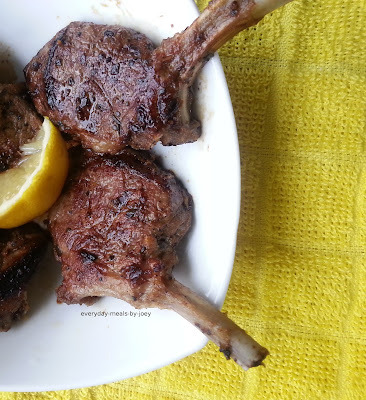 Place the lamb cutlets without crowding them and cook on high to seal the meat until there is a dark brown colouring on both sides. 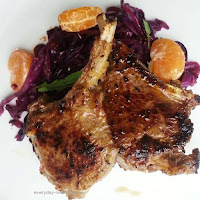 The resultant juicy, light and flavour packed lamb cutlets were gone in minutes. We had this with braised red cabbage as a main. 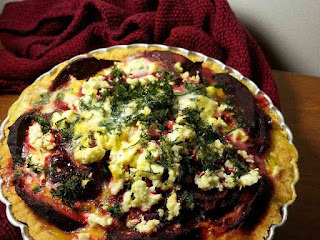 We had eaten this beetroot quiche and I wanted to recreate it as soon as I saw that beets were the produce of the week. However, I adapted it to be more likeable to the Indian taste buds. 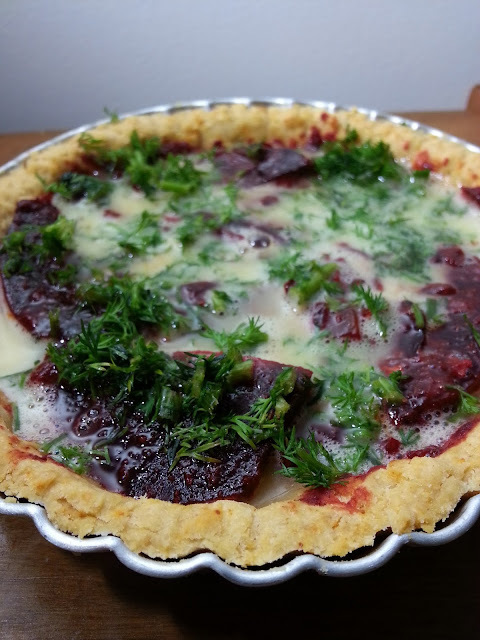 The sweetness of the beetroot goes very well with the sharpness of the goat's cheese feta and the dill then just comes in and lifts those flavours completely. In a bowl, mix the flours, red chilly powder and the salt. To this, add the butter and mix it in until it forms coarse bread crumbs. This can be done in a food processor as well. Add the water little by little until the dough just comes together. Wrap in cling film and put into the fridge for a minimum of 30 minutes. Pre heat the airfryer to 180 degree C.
Take the dough out of the fridge and roll out into a .5cm thick circle on a cling film. Use a fork and make some holes in the dough. Blind bake the base for 15 minutes. If using a proper oven, blind bake for 25 minutes. This base is good for baking other kinds of savoury tarts as well. When hot, add the green chillies, garlic and onions. Add the red chilly powder and fry for 10-15 seconds. Take care not to burn the powder. Add the water and let this cook for about 10 minutes, preferably till all the water has evaporated and the beetroot is 80% cooked. Add the garam masala powder and turn off heat. Place one layer of the beetroot masala into the quiche base. Pour half the egg mix. Sprinkle some of the dill and goat's cheese feta. Pour the remaining egg so that the gaps are all filled in. Top with walnuts and bake at 160 degree C for 15 minutes or until the egg has set. If using a normal oven, bake at 180 degree C for about 25-30 minutes. Raw kumara should be the best friend of a person on a extreme fat loss diet. Not only is the raw kumara low in calories and nutritious but eating it raw causes the digestive system to burn those calories trying to digest the kumara. However, we usually boil the kumara and eat it with a seasoning of salt and pepper for a quick weekday breakfast. I had some leftover from breakfast this morning and so I tried this kumara coconut pie bake. 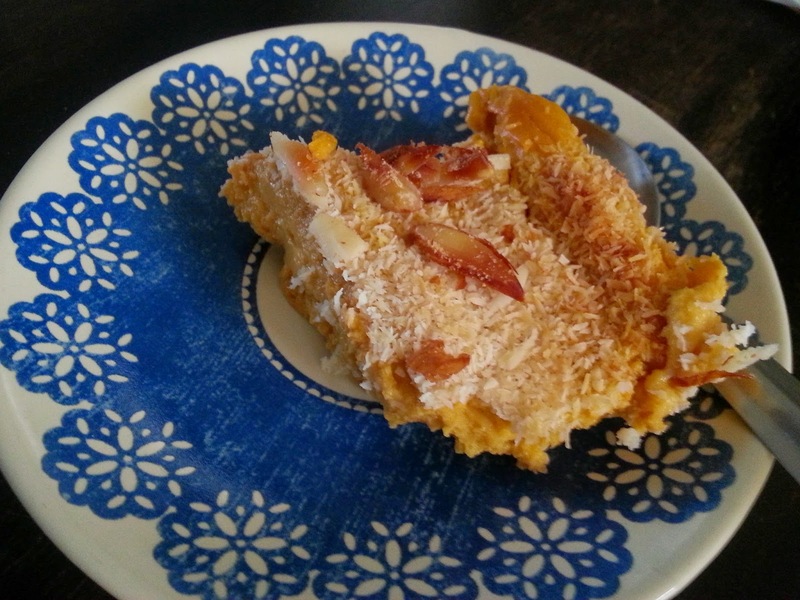 The result is a light, refreshing dessert. Boil/steam the kumara. Set aside to cool. Blend the kumara, coconut cream, egg. sugar and vanilla essence in a mixie jar until smooth. 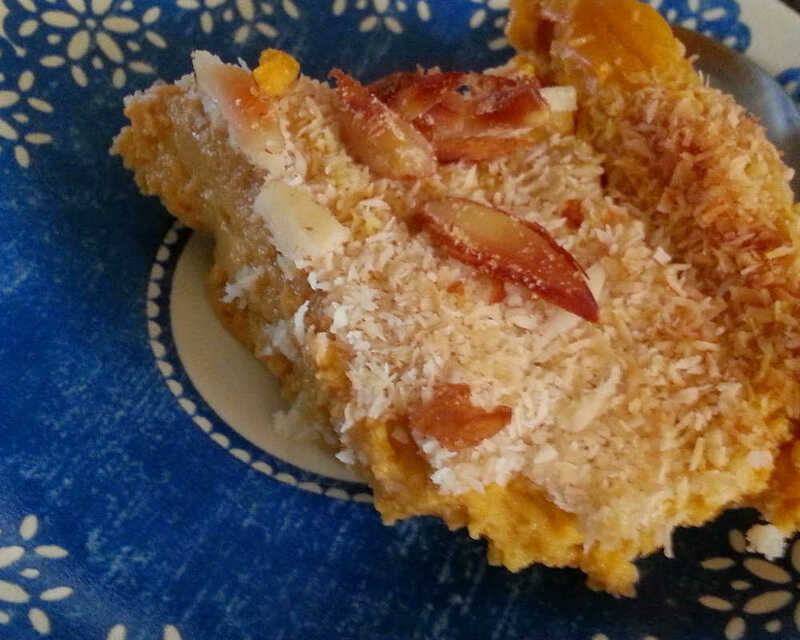 Sprinkle dessicated coconut and slivered almonds. 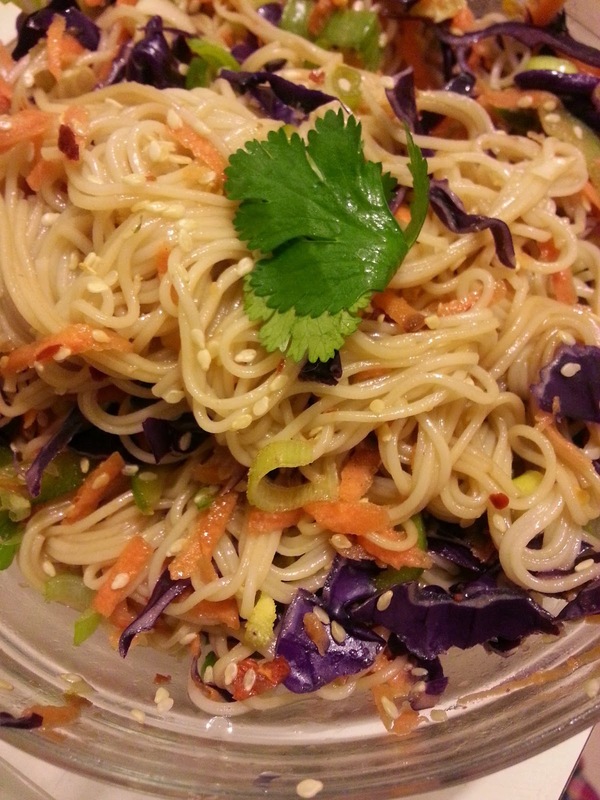 My adaptation of the Japanese noodle salads. The Redergize salad from the food truck garage changed the way I saw salads. I have concluded that salads, rather than a cooked meal, can outplay the taste buds. I have, now, stocked up on quinoa and somen noodles, amongst other items, to make quick weekday lunches and dinners. This is a quick weekday lunch which can be had cold as well. Cook the somen noodles as per the instructions on the pack. Blitz together the garlic, soya sauce, red chillies and oil. Mix in the maple syrup into the above blitzed mixture. Mix in the vegetables and the noodles. Sprinkle with toasted sesame seeds and garnish with coriander leaves. I've been missing in action here lately. Blame it on paranoia if you will. The scale has started to rotate further clockwise. I realize that I need to nip it in the bud before it would become the nightmare that it had once been. I still remember the feeling on the day when I bought my first 28 inch waisted jean. "When did this happen?" was what I remember asking myself. I always was a 24-26 inch person. It took me some time and a lot of will power to lose that weight. So, I've been doing a few extra dance moves which always give me a happiness high. And while I battle these issues, the husband battles with the extra stress at work which has caused him to lose a lot of weight. Added woes should I say? In a house of two people, one is trying to put on some weight while the other needs to be extra cautious. As I prefer fresh and home made goodies to store bought items, I try to make snacks for Pras to have at work. 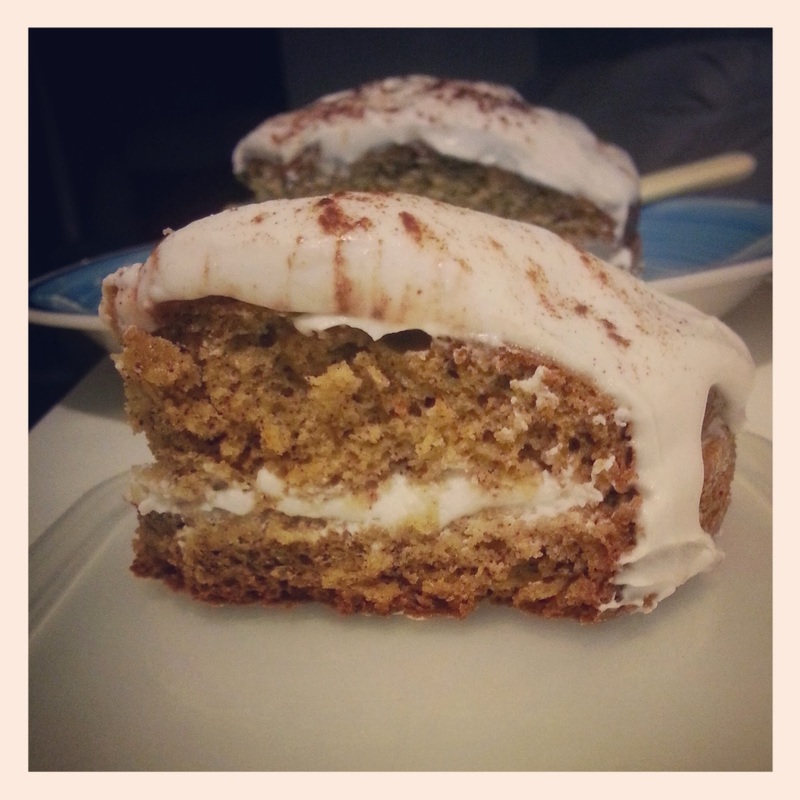 This carrot and walnut loaf idea struck me when we went to Theobroma for a hot chocolate last weekend. So, here's how I made the loaf. I adapted the recipe from one of the many sources online and I am just not sure which recipe I adapted so please forgive me. I am much grateful to all the sources of recipes out there. A multitude of devices means it is harder to track. Sift together the atta and baking soda just so as to ensure that the soda is well spread through the mix. In as little water as possible, melt the jaggery on the stovetop. Strain to remove impurities and keep aside to cool. Lightly beat the two eggs. 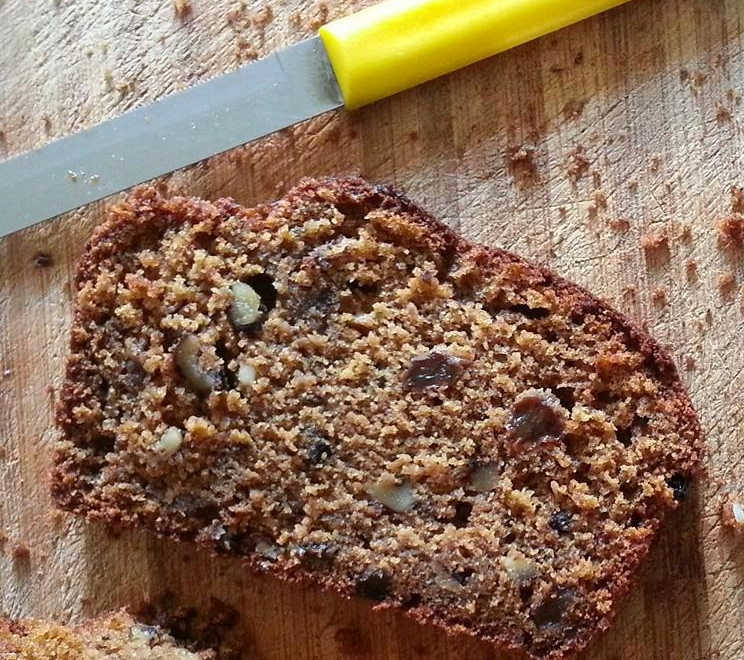 In a bowl, mix the carrots, walnuts, raisins, oil, nutmeg, cinnamon, eggs and jaggery. Add the atta mix. Fold it in without beating. Add in the curd and check for folding consistency of the batter. If necessary, add milk a tablespoon at a time to get the folding consistency of the batter. The batter should not fall out in lumps but smoothly fall and develop folds like the folds of a cloth. Pour into prepared loaf tin and bake for 1hr to 1hr 15 minutes until a skewer inserted comes out clean. Cool on wire rack and remove from tin when cool. Optionally, spread a frosting of your choice. Cut into slices and store in airtight container. A busy but fulfilling day at work is essential for me to be in a really good mood to cook. And sometimes I come home to cook a hearty meal just to feel like I have achieved something for the day. 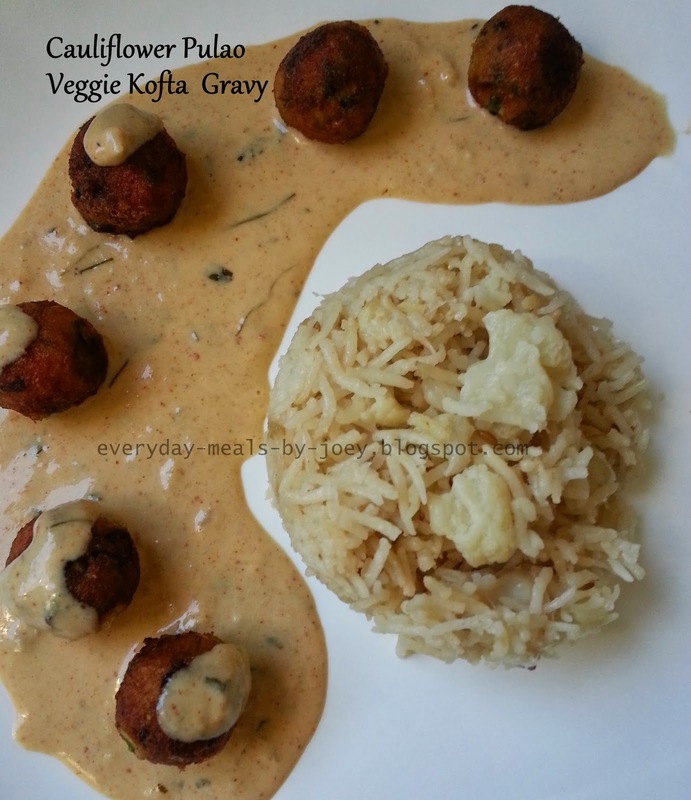 Some trawling revealed all tomato based malai kofta curries and I was looking for a creamy white gravy to put the cream to good use. So I just decided to make it my way and oh boy - we were licking our plates and then the pan after the contents were emptied into up the dabbas for the next day's lunch. To add more veggies to the meal, I made it along with Cauliflower Pulao. I've made this kind of pulao with Cabbage before and it was amazing but since I wanted to include as many veggies into the meal as we had the lemon creamcheese muffins for lunch, I added the cauliflower instead. In a cooker, heat 1 tbsp oil. Throw in cumin seeds, cinnamon and cloves. Allow them to crackle. Once they crackle and fill your nostrils with their strong aromas, throw in the green chillies. Fry for 30 seconds and then add the onions. 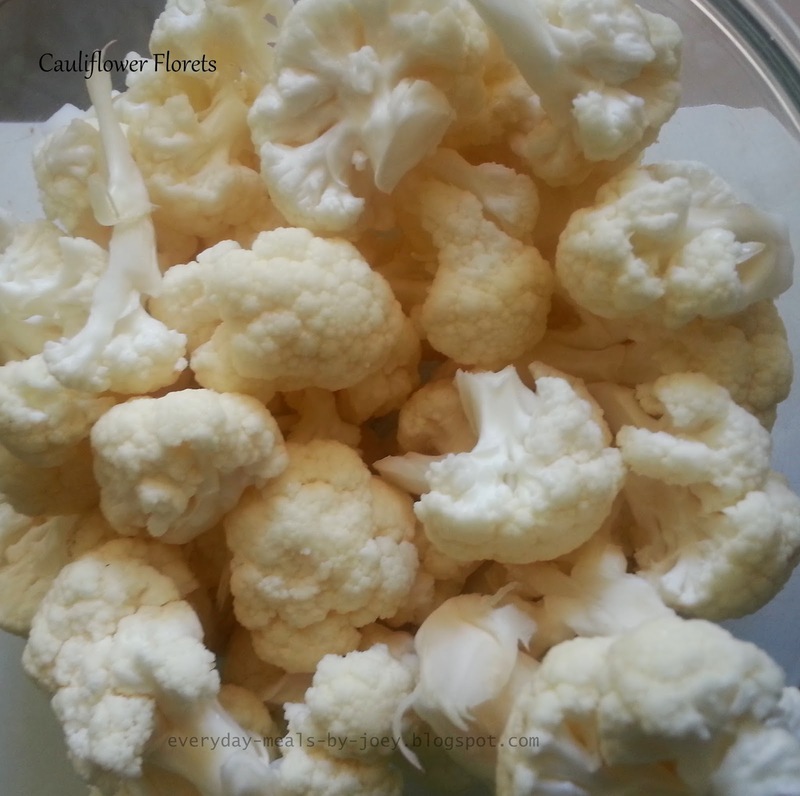 Next add the Cauliflower florets. Add coconut cream, water and adjust salt. Cover and wait for the pressure to build. Once the pressure has built up, lower the flame and leave for 8 minutes. Fluff up once the pressure is released. Zap carrot and beans in a microwave safe bowl in the microwave for 3 minutes. Peel, mash potatoes and add to carrot and beans. Add chopped green chillies, salt, red chilly powder, cumin powder and garam masala powder. Add chopped cashew bits, raisins and cornflour. Taste and adjust seasoning according to liking and shape into balls. 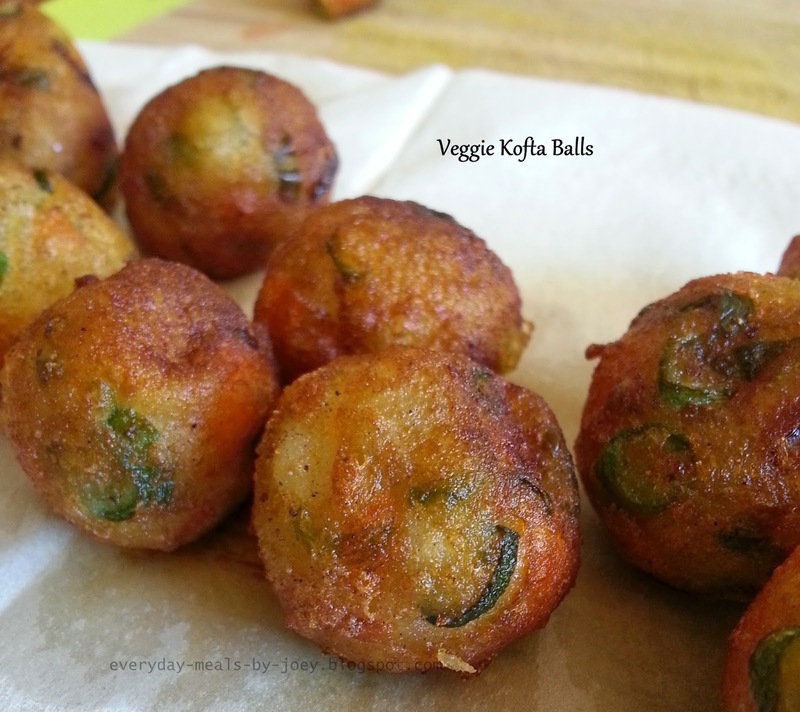 Fry veggie balls till golden brown and set aside. In a pressure cooker, cook onion and 1 tablespoon of water on high for one whistle. In warm water, immerse cashew bits and khus khus for 10 minutes. Puree the onion once the pressure is released. Grind the cashew and khus khus paste. Using a mortar and pestle, mash the ginger and garlic. Add the cinnamon and cloves. 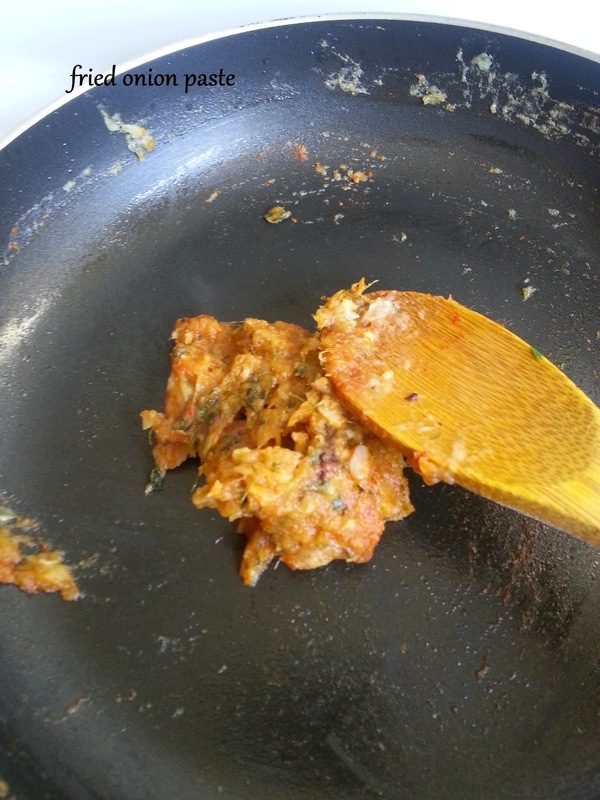 Once they crackle and leave out their aromas, add the kasuri methi and fry till fragrant. Fry the onion paste till it all comes together as shown in the picture to the right. Add turmeric powder, cumin powder, red chilli powder and fry for 30 seconds. Now add the pureed cashew and khus khus paste. Fry for 3-4 minutes till the onion and cashew paste blend together well. Adjust salt. Add the fresh cream and 1/2 cup water. Allow it to come to a boil. Add garam masala and turn off heat. 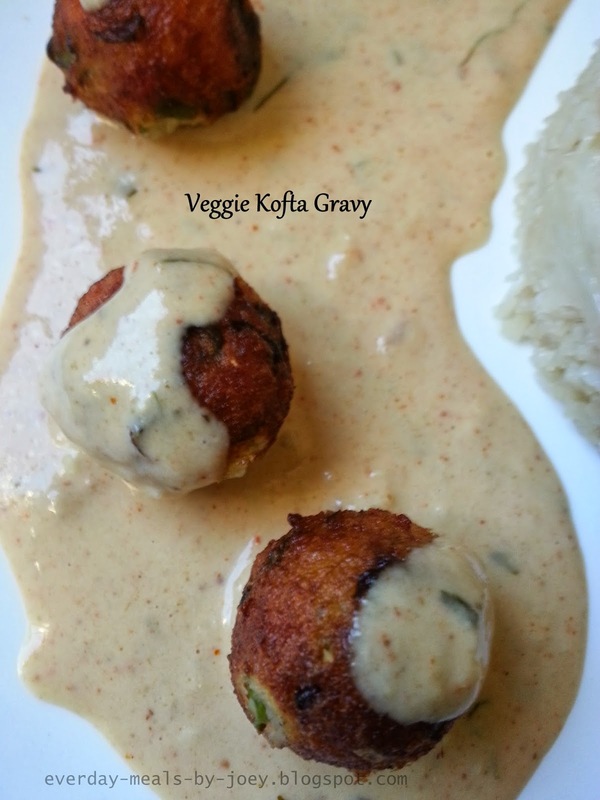 Before serving, place the kofta balls into the gravy and serve hot with rice, pulao or rotis. A glance through the newspaper while catching up on office gossip caught the words "Pick your own blueberries". Twas an ad by the 400 acre blueberry orchard. Some googling revealed that blueberry season ends mid Jan. I discarded the thought of going blueberry picking thinking I was late and began looking for orchards offering PYO Strawberries. But blueberries sounded more posh so I made the husband make a quick call to confirm if we could go for the blueberry picking and they said they were open all days from 8am. So it was decided that we'd go blueberry picking and if time permitted, go for a trek at the famous Blue Springs. Another post on that coming up real soon. The day before we went, a colleague mentioned the Hamilton gardens as a must visit. So we had a plan. Our flatmate joined us but we never really knew who he was picking the berries for. I had instructed the husband to strictly pick the ripe ones and the ones that came with just a slight feather nudge. We both managed to pick 2kgs together. Our flatmate had picked 2.3 kgs single handedly. Imagine my fear when we had to pay for that 2.3 kgs as well. I was hoping and praying that they were all good. Skeptically I opened up the bag which had the berries which he had picked to clean and sort. Kudos to him, they were good enough but now we were stuck with 4.4kgs of blueberries. So, I decided to make a preserve. 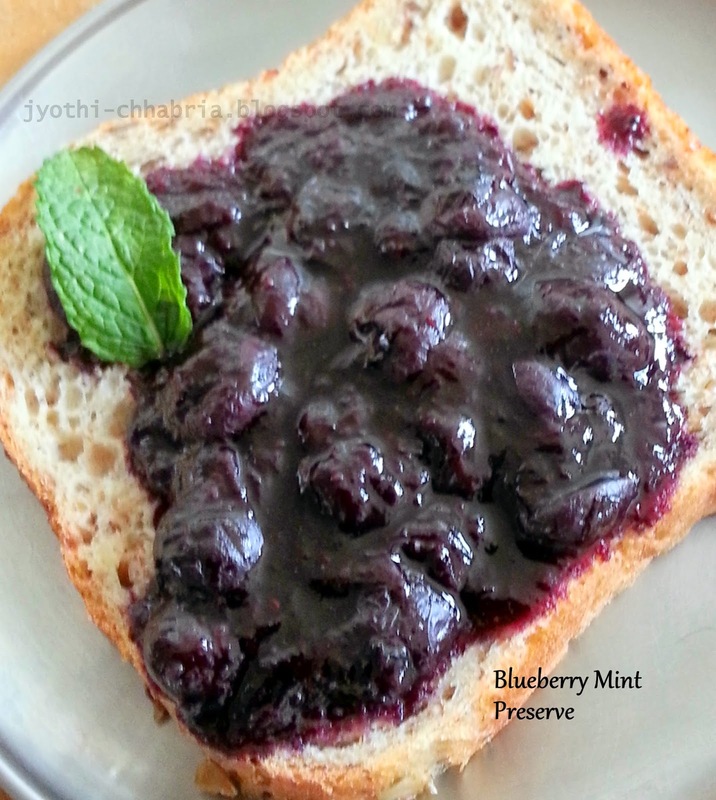 I had eaten Kitchens of India Strawberry and Mint preserve back in India so I decided to make Blueberry and mint preserve with most of them. Some I used in pancakes, some I froze, some I distributed amongst friends and some are still in the fridge waiting to be used in muffins and the odd baking. 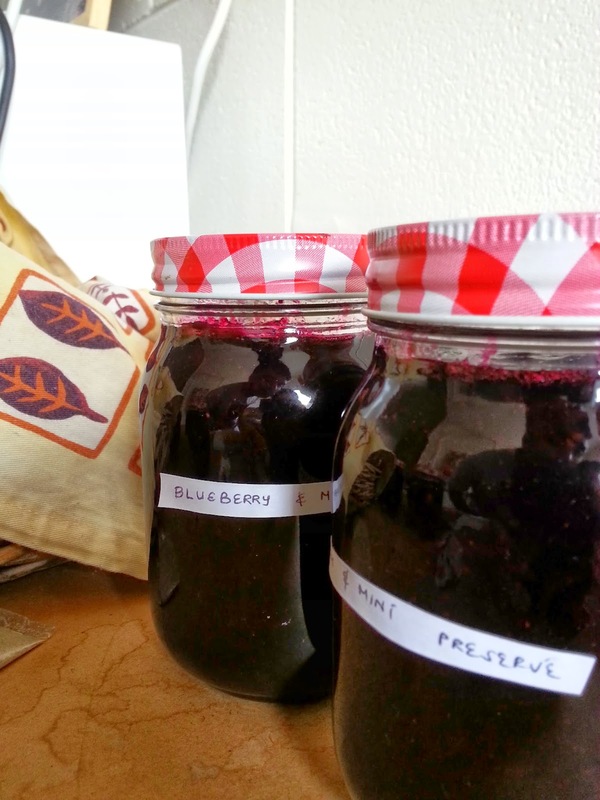 Now, this is the first time I was gonna make a jam/preserve and that too in a huge quantity. My friend had mentioned to me about how canning had to be done and what mason jars were but I had never done something like that before. So I had to google, not only for the canning but to confirm if the combination of blueberries and mint would go well. This blog confirmed it and had easy to follow instructions for the canning. So all set. The previous evenings, I cleaned and picked the stems from the berries. I also chanced upon Revati's Strawberry jam recipe and decided to use the balsamic vinegar instead of lemon juice. The next morning, I washed them berries and mashed them. Leaving them to macerate in sugar, we headed out to buy jars for canning. Detailed below is the recipe I used as well as how I went about the canning. I am not sure if I've nailed it so I will be putting my jars into the fridge to be on the safe side. In the cooker heat water till the brim such that it will immerse completely the bottles that you will be using for preserving. Place only the bottles without the lids in the water and boil for 10 minutes. For the lids, do not boil as if you are using the seals, the heat will melt the rubber coating. Just place in warm water and let it simmer. 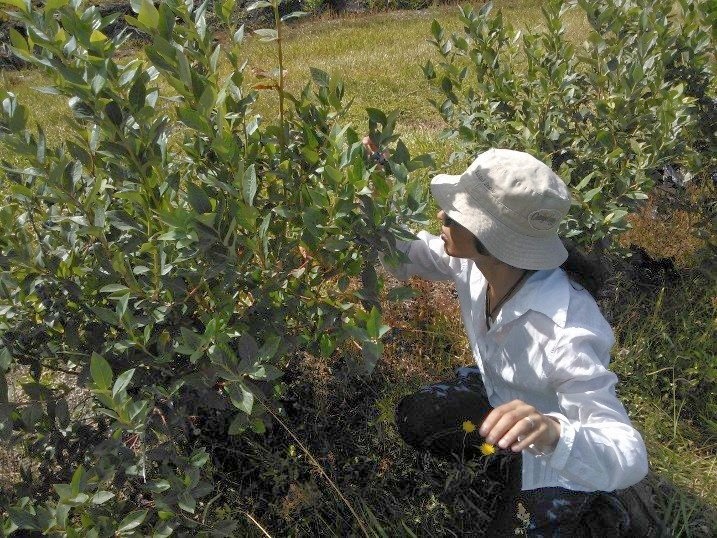 Wash and pick blueberries, sorting them so as to remove rotting ones. 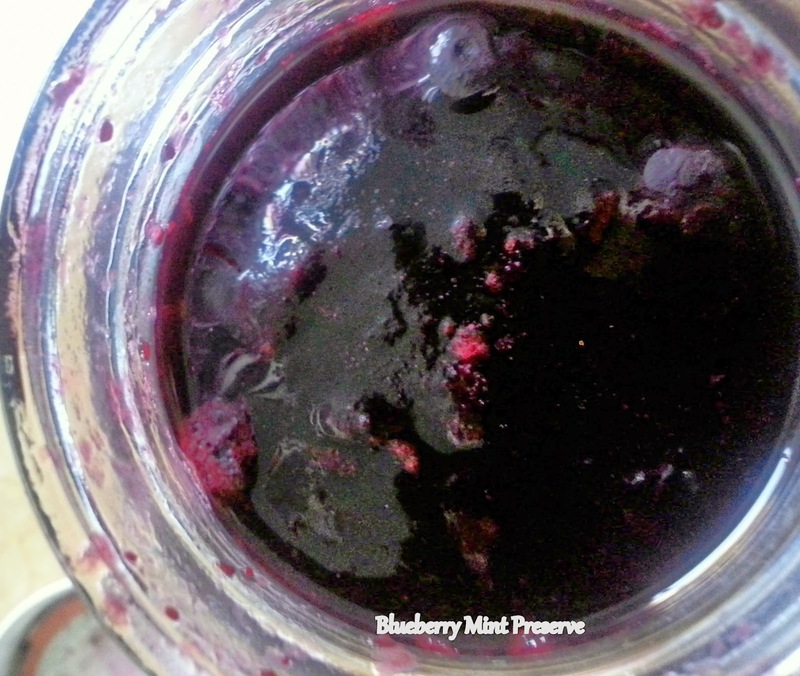 Overripe or underripe is perfectly fine for the jam. Remove any stems. Infact, I kept the just ripe ones for making muffins or froze them for use later in the year. In a huge pan, throw in the blueberries and mash them. I used my hands and the potato masher. Hands have a better effect. Add the sugar and let it macerate for about an hour. Turn on heat on medium and let it slowly come to a boil. 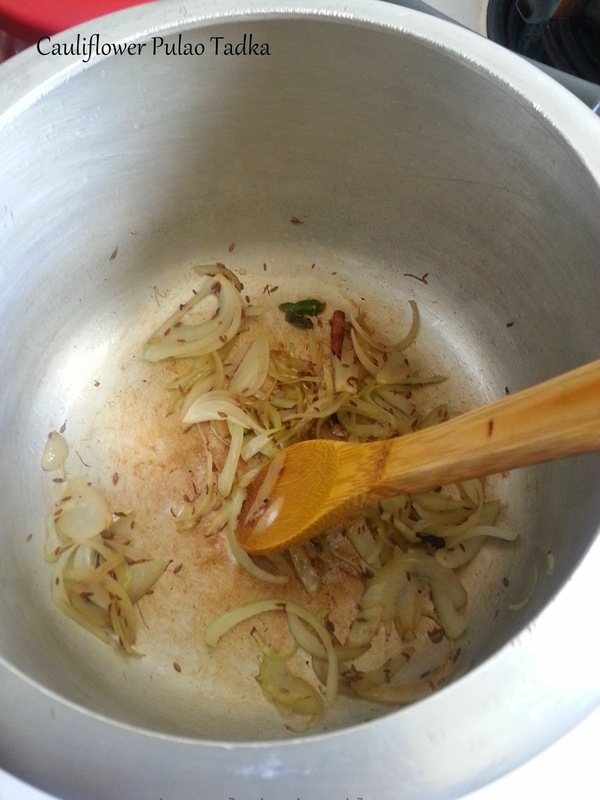 When it comes to a boil, keep stirring frequently to prevent any sticking/burning. Continue doing this for about 20 minutes. You could also do this on high flame if you are going to be constantly on watch and stirring. To test for doneness, use frozen spoons as suggested here. Take a spoon at a time from the freezer. Dip in jam and place back in the freezer until neither cold nor hot. Since I was cooking on medium to low flame, it was not that hot. In less than a minute, it was at room temperature and was set. I did give it a boil for a few extra minutes just to be doubly sure. I love the consistency of my jam. It is not to runny and not too thick. 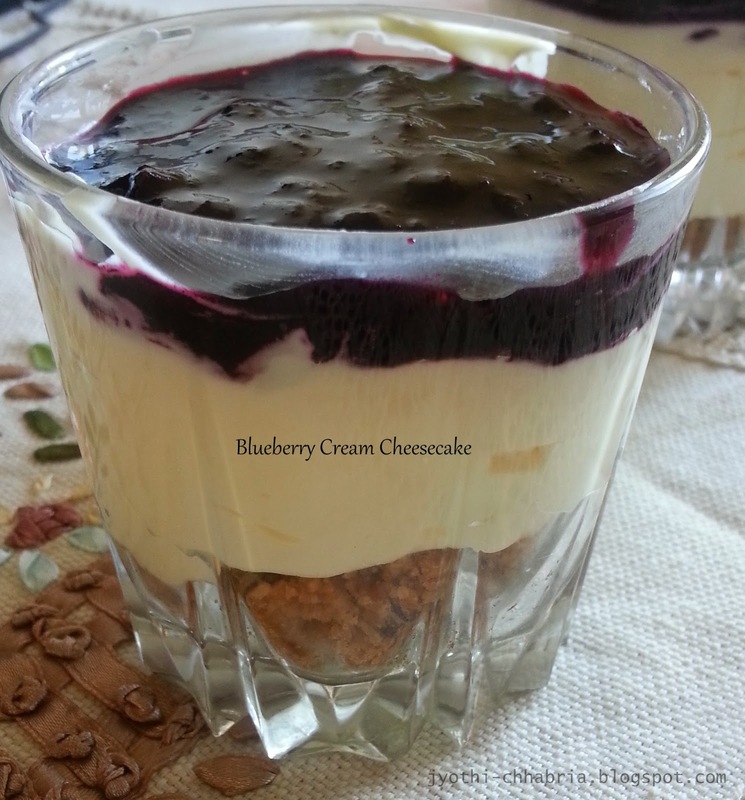 It is easily spreadable and mixes well in cream for desserts. Throw in the balsamic vinegar and mint leaves.Turn off heat and let these sit for about 5 minutes. Now put the hot jam into the bottles leaving 1 inch from the top. Place the seals and screw up the lid until finger tight and place into the hot water in the cooker or any vessel which ensures that it is completely immersed. Boil for 10 minutes. Take out and leave in a corner untouched for at least 12 hours. I did hear from my colleague who made 18 bottles of plum jam that the best way is to allow them to cool as slowly as possible and they kept theirs under a blanket. By the time I had known this, my jam had already cooled down. So you could try that. His grandmother made jam that way and they had jam even after she had sadly passed on. Inspect all bottles after 12 hours. If the lid of any of them can be pushed further, it means the seal has failed. These need to be kept in the fridge and used first. The others are good to be used for up to a year. Background daemon threads running every now and then in the back of my mind - gotta use up the jams, gotta use up the whole wheat flour before it expires, expiry date of cream is nearing, expiry date of milk is nearing and so on. It is so difficult to live in a developed country where everything is sold in bulk. So what do I do with all the store bought jam? 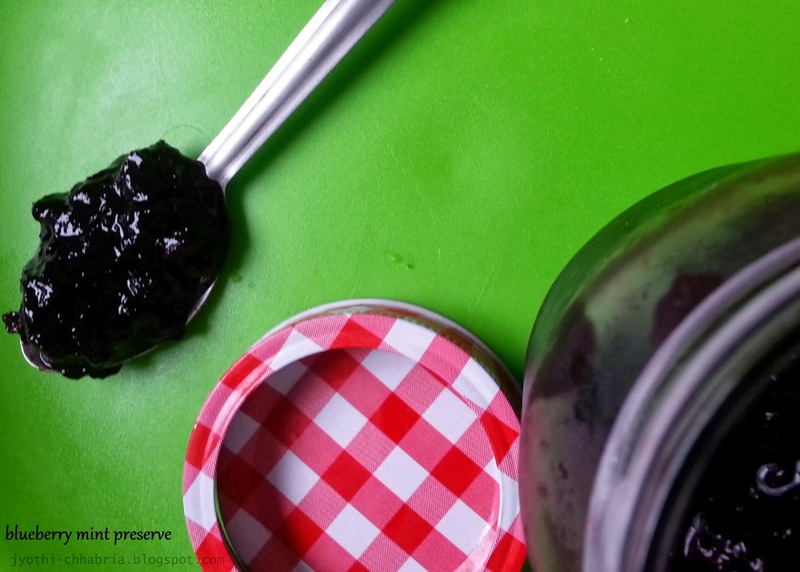 I now have 3 jars of homemade blueberry preserve (recipe coming soon - blame on laziness to edit the pictures) and so had to get rid of the store bought jam especially since we had stocked up on them during the "super deal of the week" at the supermarket. No, I don't want to be done with my own preserve, I want them to last as long as I possibly can but before they expire. I was too lazy to make these whole wheat pop tarts so I decide to take a short cut and try my version of the jim jam biscuits that I so loved from britannia. Super easy and super fast. Not to forget the heady wafts of the butter as the cookies bake. Not only was I in seventh heaven while they baked but later too when Pras downed them one after another without allowing them to completely cool. In a food processor bowl, add the flour and salt. Pre-heat the oven to 190 degree C.
Turn on the food processor and wait till the flour starts to form crumbs. Now, start slowly pouring in the cold water. You may not need the entire amount. You need to add just enough to get the dough to come together in a lump. Stop the food processor. 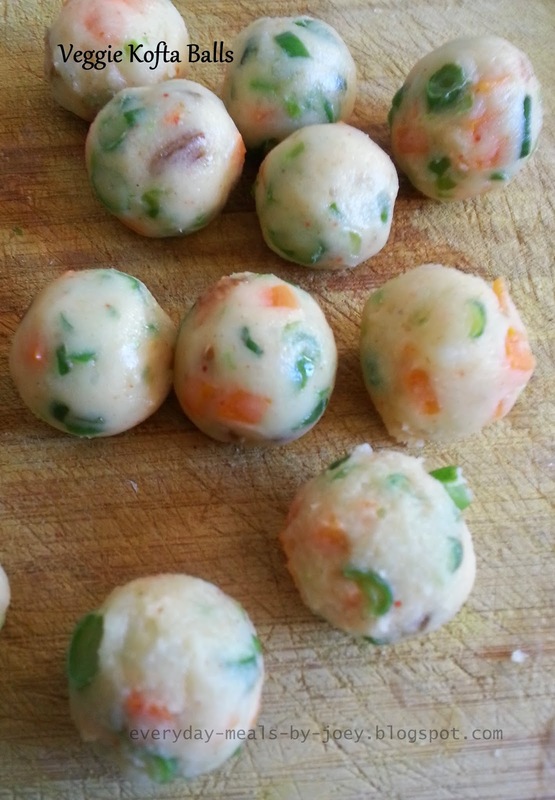 Split the dough into small balls of desired size. Take each ball in your right hand and make a deep impression with your thumb. You may need to adjust the other sides which could get a bit thick. Place onto a baking sheet/tray. The cookies have enough butter so there is no need to grease the tray. Repeat for all other balls. Bake for 12 minutes in the oven. Now take the cookies out of the oven. Don't turn off the oven yet. Put in the jam into each of the cookies. Don't overfill as it will ooze over. You may need to press the cookies a bit as the centres may have risen. I am not sure how long they will stay as ours were over before I knew it. 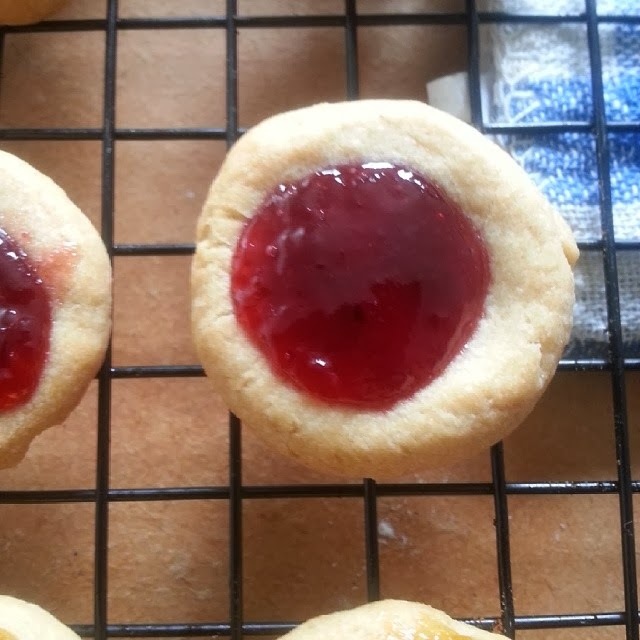 I am going to make it a point to make better use of the oven and bake in slightly larger quantities and that should not be a problem cause you can see how easy it is to make eggless wholewheat thumbprint cookies. So it was a perfect coincidence, the husband's birthday on Friday and having to make molten chocolate cake for my cooking course assignment. All the ingredients were hastily purchased on the way home but a sudden change in plan on seeing the sole ripe banana in the fruit basket. I succumbed to its beckoning. 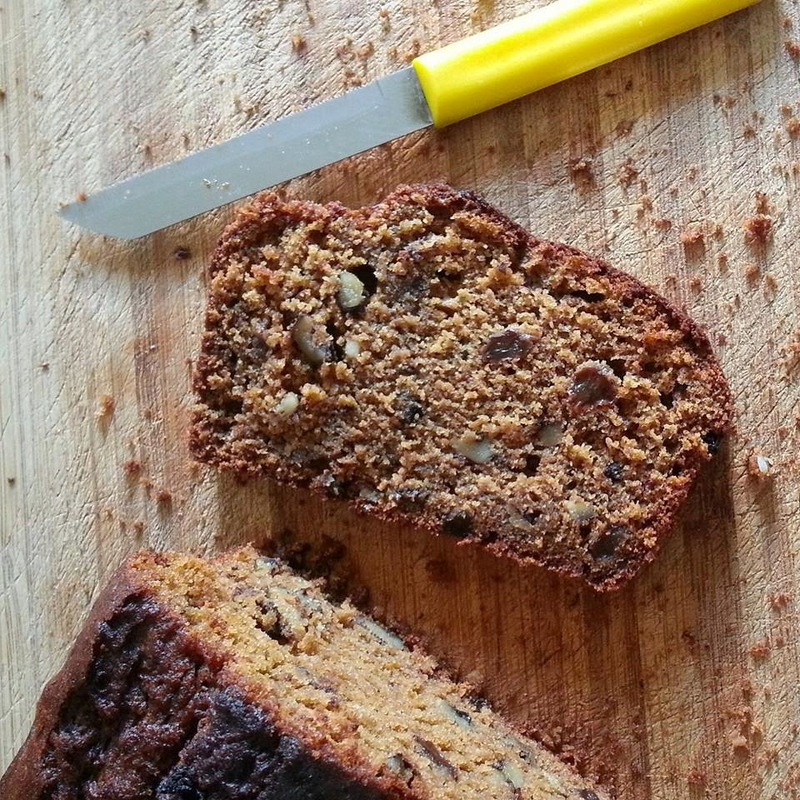 I have made banana cake multiple times before and here is one of my older recipes. 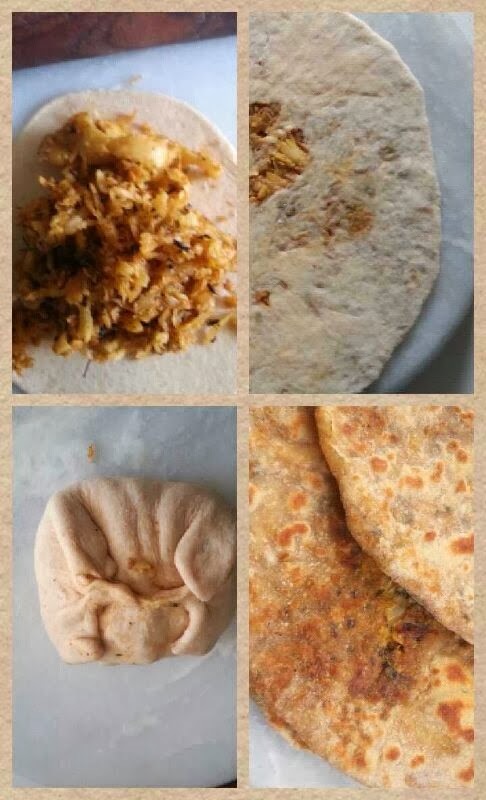 A colleague used to make it for her daughter and seeing how simple it was, I would make it every now and then. I remembered the banana cake slice that we were served after the HP Walkathon in 2012 and did some tweaking, adding some cinnamon. The result was really good and the cake was almost gone by the end of Friday. I am sure that had we not gone out for dinner, we would have licked the plate clean. all set to make the molten chocolate cake, I did not have any cream and so used coconut cream for the frosting. Ironic that I used milk in the cake but a vegan frosting(duh!! Isn't life full of choices?). On a happy note, banana and coconut - perfect mallu combination for the perfectly mallu husband. (No, he won't accept it). Now, from my cooking course, I do know that the shape/size of the baking tin do affect the results. Hence, I am sharing here the details of the tin that I used. Also please do read the tips below. A good friend did indicate this to me when we joined a online baking partners group but it did not answer all the questions and neither did I do much investigation back then. Preheat the oven to degree 180 degree C.
Prepare your baking tin by applying/spraying oil and then dusting lighting with some flour. In a bowl, mix ingredients 1 to 5. In a blender/mixie jar, blend ingredients 6 to 10. Now mix the dry ingredients in 3 to the wet ingredients in 4. Mix to combine. Do not beat. Fold in the walnuts if using some. If the batter is too thick, add milk till it comes to folding consistency. By folding consistency I mean that the batter should not fall in lumps when poured from the ladle. It should fall like a nice ribbon. Quickly pour this into the prepared tin and bake for 30 minutes. Once I had poured the batter into the tin, it was about 1.5 inch in thickness. Now, take a piece of thread - enough to go around the whole cake. (double the length if required). Use this thread to cut the cake into halves. Take one end of the thread and hold in a position midway through the height of the cake. Take the other end around the cake trying to maintain the height and bring the two ends of the thread together. Now pull the thread ends in opposite directions such that they pierce through the cake and become straight and taut in the middle of the cake, ensuring the cake is completely cut into two.Take the top layer aside and turn it upside down. Beat the coconut cream till stiff peaks form. Add sugar and mix well. Spread half of this coconut cream on the bottom half of the cake. Place the top half of the cake on top of the bottom half. 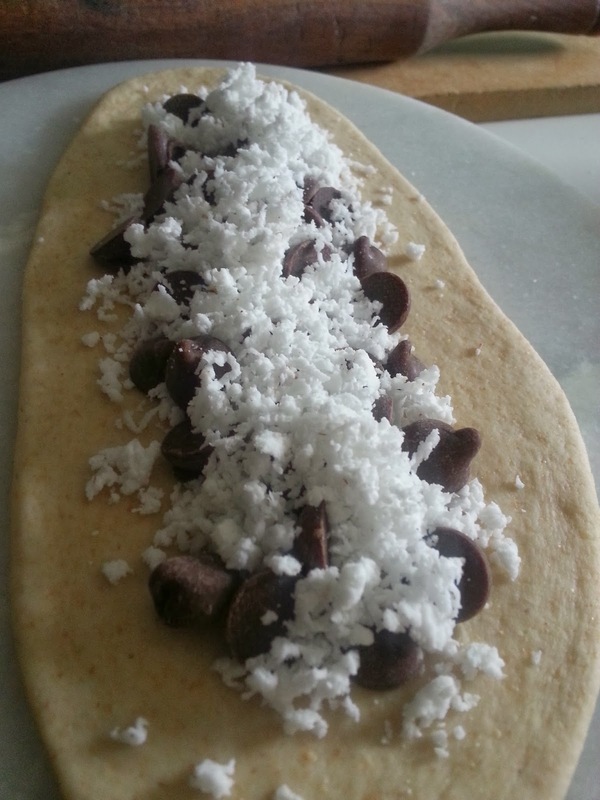 Spread the remaining coconut cream and using a strainer, sprinkle cocoa powder. Use the mentioned tin size or a suitable replacement in another shape. This is very important as the size of the tin decides how long the cake is to be baked as well as the temperature setting. A rough idea would be that heat penetrates at the rate of 0.0014cm per second through water. Now the cake is mostly water, so measure the thickness of your cake and accordingly bake. Also remember that the heat will diffuse from both directions if using a proper OTG. So that affects the cooking time as well. If not using the frosting, you could increase the sugar to 3/4 cup but this could make the cake too sweet depending on the sweetness of the bananas used. So go with your inner gut feeling. The bananas I used were sweet without the frosting itself. The frosting is not very sweet as it is a few tablespoons of sugar. Okay, never ever use bare hands to handle the radish in this recipe. Ever! I made this after so long that I forget and ended up having redness and itching on the back of my hand for about an hour. The itching has reduced, thanks to the coconut oil but the redness still persists. Anyways, getting back to the post. Another one of my favorites. Parathas are generally loved but stuffed parathas make me feel like I am eating something healthier. 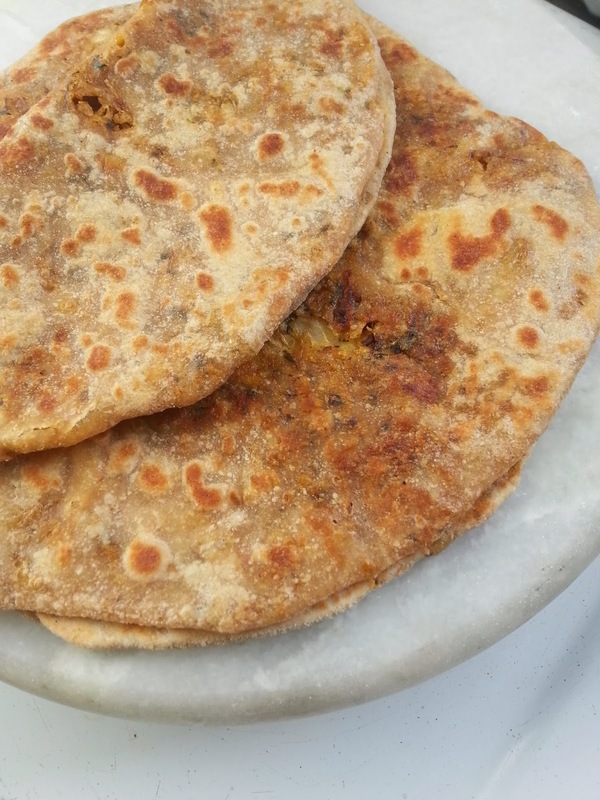 Despite their foul smell, these parathas are so delicious that they can hardly be avoided. Radish is an edible root vegetable. Baby radish are used in salads raw. In South India, they are added to sambar and in North India, made into parathas. In Mexico, they have a special radish festival wherein carvings on radish are displayed at common spots. Radish juice is considered to have cleansing powers and is good for the kidney. Some also believe that it helps fight cancer. Adding to all those benefits, this recipe ensures to make maximum use of this veggie, so do try it. Whole wheat flour - I usually take enough to make a smooth dough with the extracted radish juice. So start with a little and add as you go. Radish juice - extracted when making the above stuffing. You can use plain water as well. Wash and scrape the radish. Grate the radish. A medium sized grater will do. Now, extract the juice from the grated radish. You could either use a muslin cloth or wear a food grade glove and squeeze handfuls of radish. Retain this juice. Remember that the more juice you remove, the better. The drier the filling/stuffing, the easier it will be to roll out the paratha. In a pan, heat 1 tbsp oil. Put in the cumin seeds. Once they start to change colour, add the kasuri methi. In 30 seconds, put in the red chilli powder. Before the red chilli powder starts to burn put in the turmeric powder, grated juiced radish and salt to taste. Fry till the radish goes as dry and all the masalas are well mixed. Now add the mango powder. Mix well and let the stuffing cool. Taste and make adjustments to your taste. While the stuffing cools, made the whole wheat dough. 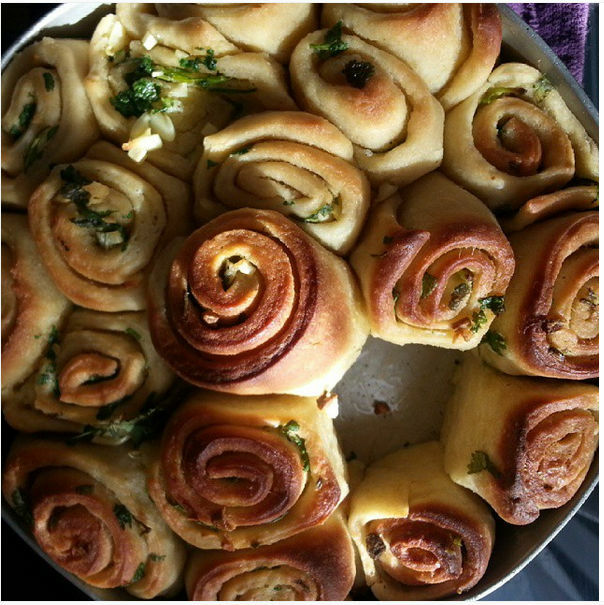 Mix the flour, salt, oil and radish juice to make a nice smooth soft dough. The dough when pressed with a finger should kind of bounce back. Make sure it is not too watery/sticky as that will make it harder to roll out. 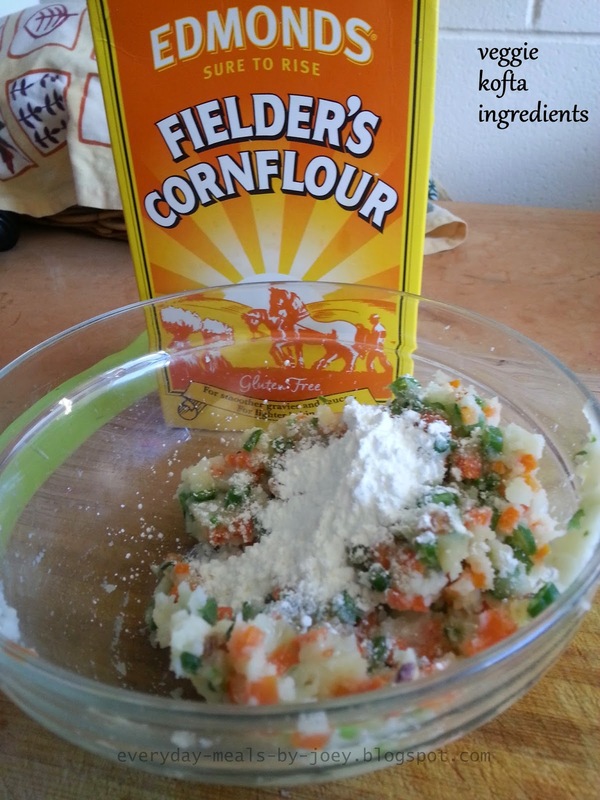 Start with a little flour and keep adding as you go as it is not possible to give an exact measurement. The amount of radish juice will differ based on size, freshness and effectiveness of juicing method used. Now, split the dough into small balls. Roll each ball out into a disc of about 5mm thick. Place a sufficient amount of stuffing, proportional to the size of the disc in the centre. Pull the ends together as can be seen in the collage above. Apply some dry flour and roll out into a thin disc. Don't worry if the dough comes apart. You can always patch it up with some dry flour. Just ensure that you have the filling spread evenly around and the thickness of the paratha/disc is uniform throughout. Repeat for all the balls made in step 12, provided there is enough filling. Else use this dough to make simple plain parathas. One at a time, place the rolled out parathas on the hot pan. Once you see that there are small air pockets forming, apply some oil/ghee and then turn. Lower the heat and let this cook for about a minute or until maillard reaction kicks in and there are enough brown spots. Apply pressure with the means of a flat ladle to help uniform cooking of all areas of the paratha. Turn, increase heat. Apply more oil/ghee if desired. Cook till maillard reactions cause brown spots- about 40 seconds. If you do get redness and itching from handling the radish, apply coconut oil and wave your hand up and about in the air, even if people think that you are crazy. Breathe! It will subside and all will be well. Make the stuffing as dry as possible to enable easy rolling. Make the chapati dough as smooth and non-sticky to enable easy rolling. Maillard reactions, named after a scientist, are those reactions which cause the browning of food. These occur at temperatures of 120 degree C. It is these maillard reactions that provide that awesome taste to food. Yes, some food have their own flavour but it is this which enhances that flavour as well as the aromas that our nose detect. It is basically a chemical reaction of carbohydrates and proteins in amino acids which releases many sub compounds. These sub compounds are very volatile and escape easily into the air. All of a sudden I was seeing a lot of pictures of eggless pull apart garlic rolls on all social networks and I thought that I should give them a try. If so many people could get it right, so could I. I shuddered at the thought of Pras's reaction as I remembered the failed attempts at baking bread in my combo microwave back in India. 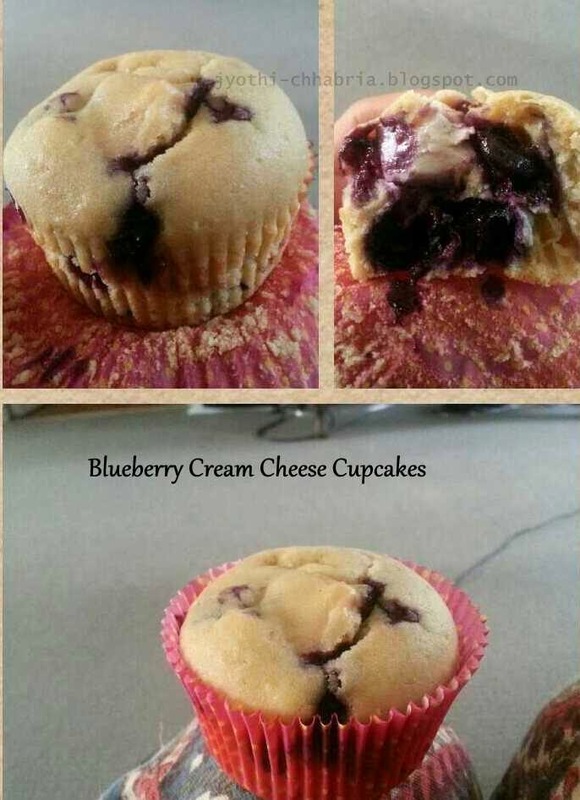 I decided to stick to the recipe and do as it says. I succeeded the first time and so the next time, I not only used half the quantity of whole wheat flour but also used my own fillings. 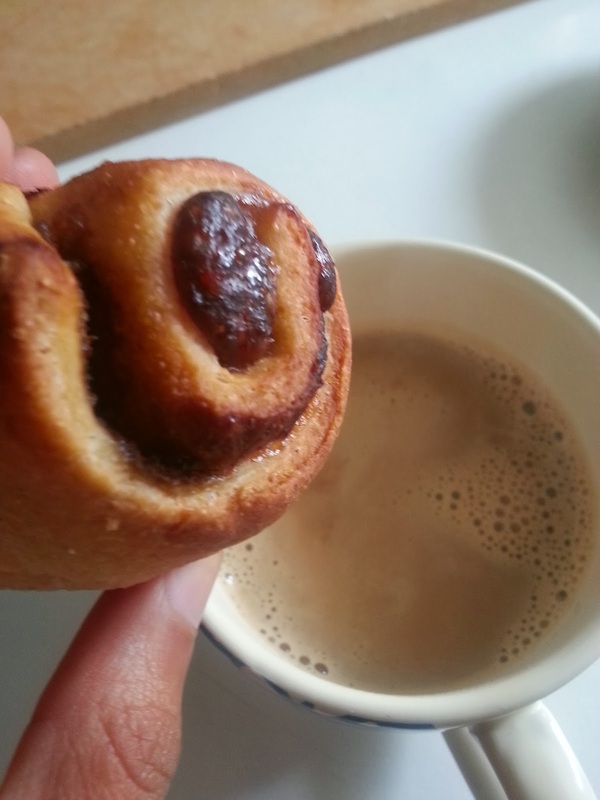 An easy snack for those lazy weekends at home. Yeast - fast action - 1/2 tbsp - I used Edmonds yeast and don't think I am going to look at any other yeast brand as long as I am in NZ. In a bowl, warm the water such that it is lukewarm - about 40 degree C.
Dissolve in the sugar and salt. Add the yeast and set aside. Mix in the two flours and add 1 tbsp of olive oil. Once the yeast mixture is nice and frothy/cloudy, add it in. Mix the dough which gets less sticky as you knead it. Knock the dough down and then split it into 4 smaller balls. Roll out each into a long rectangular shape of about 1/2 inch thickness. Spread the filling of your choice. Roll from one end to another. If they are too big, cut them into 2 inch long cylinders. Make them stand with the cut side facing up on a baking tray. Apply some more oil on each of them. If making them with the garlic butter, you could use the remaining garlic butter instead of oil. Set aside for proofing for at least 20 minutes. 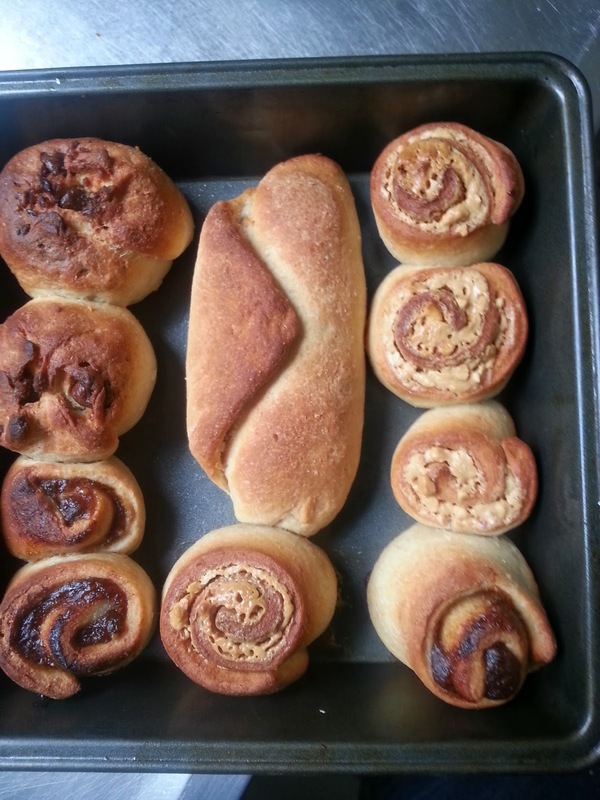 Place the rolls in a pre-heated oven at 180 degree C and bake for 30 minutes. Serve hot with a cup of tea or coffee. They disappear in no time so don't hesitate to make more.